TC Jester Dog Park Grand Opening & What Makes A Good Dog Park? The Houston Dog Park Association is hosting the TC Jester Dog Park Grand Opening Party this Saturday, April 24th from 2 til 4 pm at TC Jester Dog Park located @ 4201 TC Jester Boulevard (Near Northwest Houston). Lots of fun doggie vendors with goodies to give away, refreshments, entertainment, appearances by city officials and a FREE dog behavior session in the park. Come help celebrate this new dog park! Visit the HDPA website for more information. A dog park can be a wonderful place for dogs to socialize. However, some dog parks are better than others, and some dogs do better at dog parks than other dogs. To help you assess your local dog park, the Association of Pet Dog Trainers provides this information to help you decide if a particular dog park is the best option for your dog. Below are attributes which can make a dog park a good place to bring your dog or a place that has the potential for problems. Very few dog parks are perfect so consider your dog’s temperament along with the features of the dog park and make an informed decision about whether or not your dog will have an enjoyable time at the park! which can spread disease to humans. Cleaning up after your dog – particularly in urban areas – is a demonstration of good citizenship we should all practice. *Drinking Water and shade — Dogs can’t cool themselves as efficiently as humans and therefore must have access to drinking water and shade. Dogs play very strenuously in dog parks and water is an absolute necessity – if there is no water available, it is very possible that dogs may suffer from heatstroke, which can be fatal. 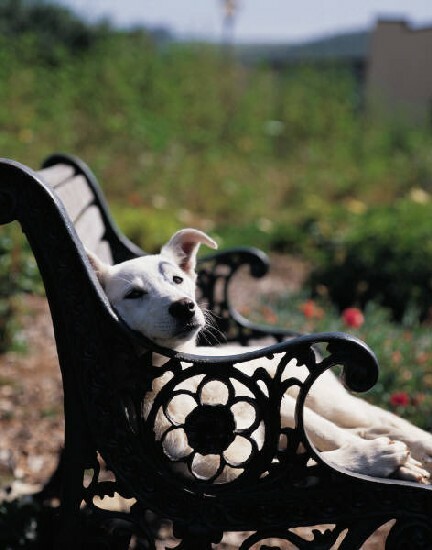 Additionally, there should be shady areas where dogs can lay down, cool themselves, and rest before continuing their strenuous play. out more often under crowded conditions. dog park, and there is the potential for a dog to escape. *Entrances and exits with a two-gate system so dogs can’t escape from the park accidentally — Parks with a two-gate system avoid the possibility of dogs escaping from the park, increasing the safety of all the dogs. *Natural visual barriers within the park (hills, trees, etc.) — Not only do natural visual barriers create a more enjoyable environment for both dogs and humans, but they also offer dogs a way to avoid problems. If a dog feels he is being targeted by a bully or pack, he can remove himself to a location where the bullying dog(s) cannot see him and they will quickly forget about him and move on to other activities. *Special enclosed areas for smaller dogs; e.g., under 20 lbs. — It can be very dangerous to take a small dog to a park frequented by large dogs. The large dogs may not mean to hurt the smaller dogs, but they can play too rough, or they may see the small dog as a prey animal and pick it up and shake it, which can be fatal. Exceptional dog parks have an enclosed area specifically for small dogs. This keeps them safe, yet still allows them to socialize which is especially important for smaller dogs. behavior and will not allow it to continue. By stopping the behavior, they are teaching the bullies how to behave appropriately in a social situation. *Dogs forming loose packs – If dogs begin forming loose packs and no one breaks them up, there is potential for serious behavior problems. These dogs will gang up on weaker dogs and may even physically attack them. If, on a regular basis, the dogs (particularly if they are always the same dogs) continue to pack together, this is a park to be avoided unless the problem can be effectively addressed. Become a fan of Get Along Little Doggie on FACEBOOK!